We are proud parents with two boys who brought sunshine and muddy footprints into our world. We have one biological son (16) and an adopted son (14). This is personal blog started in April 2015, nearly a year after our youngest son was diagnosed with Fetal Alcohol Syndrome, the effects of which were compounded by early neglect in the orphanage where he lived until the age of 16 months. He has neurological damage that has resulted in difficulties in his ability to perform executive functions (i.e. – more abstract thinking). This condition is severe and lifelong. He also has some related physical issues with his spine and bones that also are the result of exposure to alcohol in utero. Until the beginning of Year 8 he was in mainstream schools. As the academic and social demands on him of a larger mainstream setting became overwhelming, we moved him to a specialised school for children with mild to moderate learning difficulties. He has amazing strengths – he is superb at music/dancing/singing (we have been told he may have perfect pitch) and an excellent gymnast. He is a generally positive, loving, and resilient child. He has ADHD, without the inattentive side of it. He does not have autism due to his social reciprocity abilities, but he does have some restrictive repetitive behaviors. We are on a journey as a family to learn what we can about FASD to maximise our child’s prospects for the future. We are concerned parents trying to navigate our two boys into their adulthood. Please understand, we can take no responsibility for the information provided via links and we do not seek to offer medical or other advice. We are sharing our experience in case it might help others on a similar journey. This personal blog is not related to any organisations with which we are affiliated in our professional capacities. Also – a note on language: we have been learning and growing as this journey has unfolded. 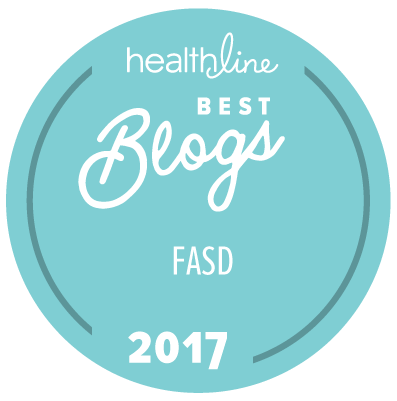 For example, we first started off using anonymous twitter handles of “FASD_Mum” and “FASD_Dad”. That was before we met parents who themselves have FASD. We have changed those handles now to SB_FASD and MB_FASD. We are learning more and more every day about how to discuss these issues with respect and dignity for all. We welcome discussions on this and ways to improve.